We had recently discussed about the latest Android OS- The Android 4.2 Jelly Bean OS, which was released at the Google event. Now here comes some more good news..
We came across some leaked app updates and this time the Android 4.2 is more about the excellent camera app and yes, not to forget, the new keyboard for the users. The first feature about the OS which leaked out is the GESTURE KEYBOARD. The only requirement for installing the Android 4.2 keyboard is that your phone needs to be running at least Android 4.0 Ice Cream Sandwich and up. 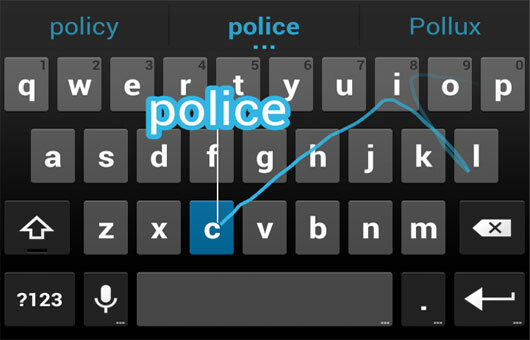 The Gesture Keyboard is nothing but Swype. But, here you need to drag your finger to type instead of tapping. It is quite cool that Google is now providing a tertiary input method (alongside normal typing and voice typing) on the stock keyboard. It integrates seamlessly, too. There's nothing to turn on, nothing to toggle - it just works. The Droid Life has managed to put up an apk file as well as a flashable zip file of the new Android 4.2 keyboard that has apparently been pulled from a Nexus 4 system dump. Here’s how you can install it on your device. There are two options: an easy to install APK, which won't work on a stock Android device (aka Nexus), but it will work if you're using a custom ROM like CyanogenMod or AOKP, or a device with a manufacturer overlay like a Galaxy S III, HTC One X, etc. The other option is a ZIP file for those of you on a rooted stock Android device, which can be flashed via ClockworkMod Recovery. Remember, if you flash the ZIP, it will replace the stock app, so it would be better to take backups before flashing. Once you have finished flashing the zip file in recovery, just reboot your device, and activate the new Android 4.2 keyboard from the Language and Input option in your phone settings. It has been checked out and it is really cool. Go on and have a look at the app. 0 Respones to "Gesture Typing Keyboard of Android 4.2 Leaks Out"